Last time I wrote about why it’s worth it to become a data scientist. This time I’d like to answer another important and very common data science career question: is data science for you at all? Do you have the skills? Can you learn it? Will you enjoy it? It’s really important to clarify these questions because many articles on the topic imply that a data science career is an easy way to become rich, happy and smart for good. In fact, it’s not easy at all; it requires continuous learning and practicing of difficult and complex concepts, technically during your entire career. On the other hand, we all know that the hard things are the things that are worth doing. The greater the challenge, the greater the reward, right? But is data science for you? Let me help you decide. Will you be able to learn and understand Data Science? I don’t believe in talent. I don’t think that anyone was born being better – either in statistics, mathematics, coding, business, communication or anything else – than others. I believe in skills. I think that some people are better than others in some things because they are continuously practicing and developing their skills – for years, for decades, for their entire life. Thus I strongly believe that nowadays anyone can acquire any skills if she’s really dedicated to it. Simply put: if you want to learn data science, you can learn data science. I’ve found that one can only work on a specific skill without losing motivation if she enjoys the process of learning and practicing. I won’t cite cliches like “do what you love, and you’ll never work another day in your life” because that’s not true anyway. Working on something always has its ups and downs, but if you generally enjoy the process, that will definitely help a lot to keep you in the flow. So the most important question for me before you start your data science career is: would you enjoy data science at all? See if these seven statements below are true for you! If most of them are – plus you are ready to put the hard work in – that means that you could become a great Data Scientist! Here’s a simple test: when you play board or card games (like poker or Monopoly), do you believe in luck? Or would you rather calculate the probability of different scenarios? Instincts are great; but a data-minded person bases her decisions mostly on facts; or when not all the facts are available (for instance when you can’t see the cards of the other players) then on probability. Another example. When you read news, are you only reading the story, or you check statistics, too? If you are generally interested in seeing and analyzing the rational side of everything – and not just the emotional – that’s a good sign that you would enjoy data science. Needless to say, if you are looking for a data science career, you will work a lot with numbers. So you will have to enjoy mathematics and statistics. I see mathematical and statistical calculations as sudoku or crossword puzzles. Solving them satisfies me. And this mindset has a great effect on my daily job. When I have to understand a new machine learning model for a predictive analytics project, I get excited and I can easily spend hours studying the mathematical concept behind the model. I have to add that I am really, really lucky because I had great math teachers in school who always presented maths as the single most exciting discipline on Earth. I know that many people are not that lucky and had bad and demotivating teachers… Even if that’s you, it doesn’t mean that you would not like mathematics now. 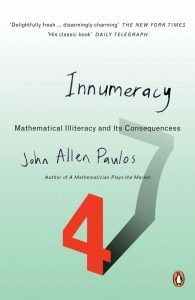 Here’s a good light-read math book I recommend: Innumeracy by John Allen Paulos. Read it and you will see whether mathematics makes you excited or not. Anyway, if you enjoy maths and stats that’s another good indicator that you would enjoy being a data scientist! Watch out, it becomes tricky. Mathematics and statistics are really pragmatic, but business often needs the “think-outside-the-box” approach. And a great data scientist needs a good sense of business, too. It’s not enough to create an analysis. You have to understand how and why that analysis becomes useful and actionable. Also, you have to understand that if a data project is interesting for you, but creates no business value, then you should skip it. A big part of a data scientist’s daily job is coding; during your data career you will write a bunch of scripts, automations and programs. You have to keep in mind that coding is a very introverted activity. You sit in front of your computer for hours, and type. For some people this is relaxing; for others this is boring. There are several ways to build up an efficient data team but by far the most common solution is to have a central data team and assign its members to other teams within the company (e.g. marketing team, sales team, product team #1, product team #2). This means that you will actually have to spend a fairly large proportion of your time with non-data people: managers, developers, marketers, sales people, etc. And those people can be… annoying. Well, they are not annoying for real, they just have a very different mindset. But if working with a chatty marketer or a strong-willed leader is not your cup of tea, then most probably you wouldn’t enjoy your data science career, either. In the beginning of their journey, most data professionals are not too good at presenting their findings. They overcomplicate things, they add uninterpretable charts and they get speech anxiety even in front of a small audience. However, I know from personal experience that it’s really easy to get better at presenting by practicing. I was lucky enough to be a member of Toastmasters clubs. Not only did I develop my own presentation skills there, I also witnessed many IT professionals to go from zero to hero in public speaking in less than a year. This applies to all professions, but I personally know it’s important for data science. For two reasons. The more obvious one is that data science is an ever-changing field. While the basics – like the mathematical background or the languages you have to use (Python, SQL, R, bash) – count as evergreen knowledge, new methods, tools, tricks and solutions are coming out year by year. The other reason is “domain knowledge.” I’ve already mentioned in my previous article that there is a lot of horizontal mobility in data science, which is awesome. As a data scientist you can easily find yourself at an IT startup, at a logistics company, at a trading company or wherever. And every time you change domain (because you go to another company), you have to pick up the domain knowledge… Analyzing a viral marketing campaign requires understanding of how viral marketing works. For stock exchange related jobs you have to know stocks. If you optimize logistics process, you have to be familiar with logistics. That requires continuous learning. Thus learning is the #1 thing you have to enjoy if looking for a data scientist career. As you can see, a great data scientist has a good combination of introverted, extroverted, rational and emotional skills. Again, with practice, you can improve all of them… The biggest question is if you want to. I hope that by the end of this article you have a clearer picture. And if the answer is yes, stay with me: on this blog I’ll help you to reach your goals! Excellent blog! I think that one should strive to understand the underlying models and their limitations. There seems to be some “data scientists” that are good at using the numpy and pandas libraries in Python, but have little sense on the particular choice of, say, a statistical test. I’ve just started my “Statistics” article series! It starts from the basics but sooner or later it will touch the ML models, too! I believe many of the factors play in part of loving data science. Not only should one love the probability and coding, but have a passion for challenge. For many, coding will play as a major challenge and if one is not up for the challenge, then data science may not be the best career. If challenge drives your motivation, then dive right in! Good article. I am veteran coming from IBM mainframe and it’s never late to start with new challenges.. Perfect. A delicious read which I believe accurately sums-up the required profile for such a job. Many people nowadays tend to rush and jump on the Data Science “Hype Train” without taking the time to understand that it is not just a job and not as accessible as advertised online, in institutions and on job postings. There is a profile required to be able to grind out a job like this and more often than not it is linked with a person’s set of traits, characteristics or for short overall personality. This article highlights just that instead of listing the required soft skills to succeed as a Data Scientist. It dissects the persona of the people filling in this role well, which makes it both credible and accurate. I was randomly browsing the internet searching about Data Science. Good thing I found this article. It has been almost a month now that my bro suggested me to try Data Science. But I’m reluctant in trying this career path. This article shed some light know i kinda think that Data Science fits what I want. Thank you for the awesome article.